Home > Blog > My Accident Story > Mold and Toxins in Apartment – Do I Have a Case? Mold and Toxins in Apartment – Do I Have a Case? Why is nobody helping despite endless evidence of mold and toxins in Andrea’s apartment? Andrea Pena, who lived at the Agave Villas in Irving, Texas, was delighted to receive a kitten for her birthday. It was May 2017, and the kitten – Oliver – was only seven weeks old. He was very playful and active, romping around her apartment. Those “issues” would be related to part of her ceiling falling after a Time Warner technician was working in her attic. At first just the corner of a panel was exposed, but then gravity took hold and the entire section collapsed. Her cat knew by instinct not to go near that area, and Andrea’s boyfriend, Jesus Gonzalez, put up plastic sheeting to cover the hole after cleaning up the mess of insulation. Andrea was in constant contact with her leasing manager, Maria Gomez, who worked for Legend Asset Management. This company is in charge of managing several Texas properties, Agave Villas included. Both Andrea and Jesus noticed the odd discoloration on part of the insulation. However, they dismissed it initially as dirt and tried to make do with a sheet stapled to the ceiling. Oliver passed away soon after. “Within two weeks he went from healthy to deathly sick,” Andrea said. The veterinarian said his health issues were undetermined, and they put him down on July 15, 2017. That was only the beginning of the family’s sorrows. The hole was not repaired until the middle of August, leaving them with bits of insulation falling for the better part of a month with rising heat during the Texas summer. 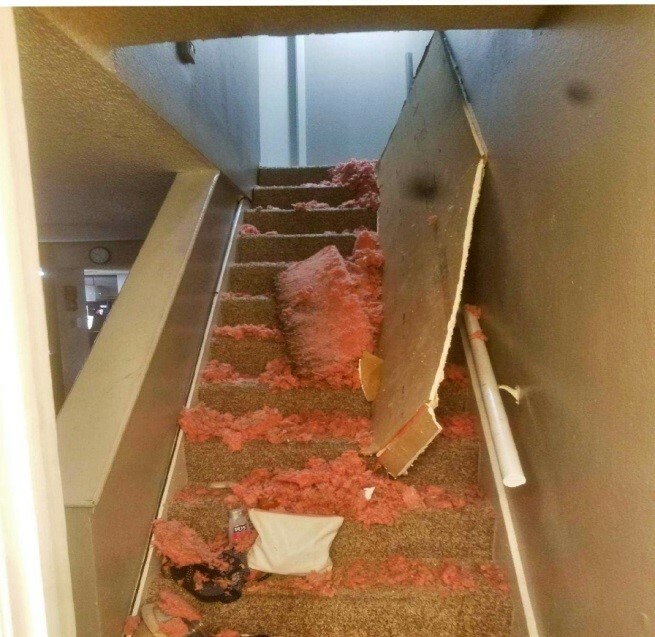 They tried to avoid it as best they could, but their bedrooms were atop the stairs – so every morning and evening, they passed directly underneath falling insulation. Andrea’s daughter started experiencing allergies and having difficulty breathing. Andrea noticed a rash spreading on her skin (leading to open sores) and had her own bout of asthma. Jesus went to the emergency room in September because of chest pains, fatigue and shortness of breath. None of them had suffered from any of these symptoms before. Jesus was admitted to the hospital and diagnosed with congestive heart failure and pneumonia; doctors could not say why he was experiencing those conditions, as he was a previously healthy 36-year-old man. Then, one of his doctors asked if Jesus had been exposed to black mold. “I answered ‘no,’ taking offense,” Andrea said. “I am a very clean person!” However, she started connecting the dots and realized that all of these symptoms had arisen following the opening of her ceiling. 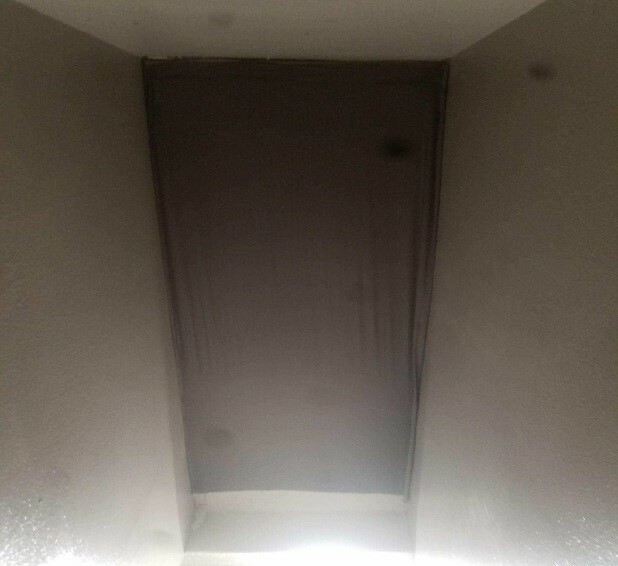 She began to do her own research and take pictures to send to her building manager, though she received unhelpful responses despite finding what looked like mold in several places – including the air vent. Even her neighbor and her two kids were suffering from the same symptoms, enough that Andrea offered up one of her air purifiers. Andrea contacted the City of Irving and Texas Health and Human Services, who sent out an inspector that advised her of tenants’ rights and said she did not think that the apartment was suitable for habitants without repairs. When Legacy Asset’s building manager still failed to take action, Andrea insisted that HHS perform an air quality test. The results were shocking. Concerning levels for formaldehyde start at 0.1 ppm; meanwhile, Andrea’s apartment was 0.27 ppm. Anything above 0.1 can cause irritation of the respiratory tract, as well as other health issues. Her family went from financially stable to barely making ends meet and applying for government assistance because of all the medical bills. They moved house after only nine months of living in the unit, abandoning $4,000 leather sofas and other possessions for fear of contaminating the new space. And they didn’t even get their $400 rental deposit back. The scariest part is that Jesus is no longer able to work because of his health problems, and doctors found a spot on his lungs that is getting larger at a rapid click. Exposure to formaldehyde can cause significant lung issues, as well as cancer. He is currently waiting to see a toxicology clinic and an appointment with a pulmonologist. Despite approaching several attorneys, none has decided to take her case – there’s not enough money in it for them to make it worth their while. Perhaps the attorneys fear the inevitable causation issue – were those health problems caused by the insulation? Was it really the formaldehyde that caused Jesus’ lung spot? Without spending more money and trying more tests, it will be difficult to establish a causal link. From an attorney’s perspective, not taking the case might make financial sense. But what about from a human’s perspective? Beside shining a light on this very large problem and hopefully getting someone to notice, Andrea seems left without options. Maybe a pro bono attorney with experience in this area can provide assistance. If you are able to help Andrea and her family, please contact us. I am 72 years old have been in and out the hospital for mod got paper work that show its mod thats making me sick. Thanks for commenting, Lavada. Unfortunately, we’re not a law firm, but we can help you find someone who can help. We invite you to use our free attorney directory to find a law firm near you: https://www.enjuris.com/personal-injury-law-firms/. Schedule an appointment with an attorney (the first meeting is usually free) and be sure to bring your paperwork. Best wishes and we hope you get well soon!